Warren CAT has been proudly serving equipment owners in Oklahoma, West Texas and the Texas Panhandle for decades. In recent years, hydraulic systems have become standard components in many types of heavy machines, providing substantial performance increases. Along with the sophistication of advanced hydraulic systems comes the need for specialized hydraulic repair service in the event of a mechanical malfunction or breakdown. For hydraulic service and repair, contact us online or call 866-292-7736. As our service business has grown, our hydraulic repair service capabilities have expanded to offer service on any make or model. 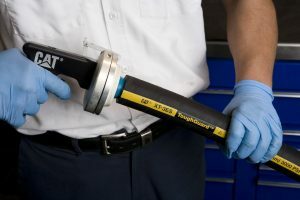 Our service technicians receive professional training and have experience in all types of hydraulic repairs – from cylinders and pumps, to motors, valves, hoses and work tools. Additionally, we offer a full line up of replacement hydraulic parts. In addition to Cat®, we are capable of servicing a variety of allied equipment, including Sauer, Sundstrand, Danfoss and Bosch Rexroth. This includes assembly/disassembly benches, plus pre- and post-repair high flow and pressure test fixtures that meet the high torque requirements of today’s equipment, including excavators. No matter how complex the hydraulic repair task may be, we can get the job done quickly, efficiently and affordably. Staffed with expert technicians and outfitted with state-of-the-art technology and equipment for repair and testing, Warren CAT hydraulic service facilities also have complete machining capabilities for cylinder rods, pistons, glands and entire cylinder groups. With four contamination-controlled hydraulic centers strategically located in our operating territory – Odessa, Tulsa, Oklahoma City and Lubbock – we are proud to offer our customers the superior hydraulic repair service, technical expertise and enhanced capabilities our competitors cannot match. Warren CAT is equipped with the latest diagnostic equipment to quickly analyze and evaluate hydraulic system performance. Results from the various inspections and Scheduled Oil Sampling (S.O.S.) Fluid Analysis are compared against new machine specs, and customers receive a complete report, including detailed recommendations for corrective action. Contaminated hydraulics cost you valuable productivity and profit everyday on the job. In addition to losing valuable time, compromised hydraulic components can have a shorter life cycle, adding unnecessary expense. If oil is leaking out, it means harmful dirt particles that can cause significant damage are getting in. Cat filters, oils and seals are specifically designed for your machine’s hydraulic systems. Hydraulic systems play an integral role in the efficient operation of today’s Cat equipment. Our custom hydraulic repair service can optimize the performance of your equipment, reducing the need for costly repairs down the road.